Pass Kontrol (Oliver Ralli; vocals/guitar, Mike Visser; bass, Adam Brown; drums and Tony Delorenzo; synths) is an art collective living and working in the vibrant arts community in Bushwick in Brooklyn, New York. They are interested in taking an innovative and creative approach to playing music with a focus on collaborative art and connecting with their community through their music, films, and shows. In three years the band has recorded eight EPs, all or which have been given away for free at various coffee shops, bars and venues around Brooklyn. 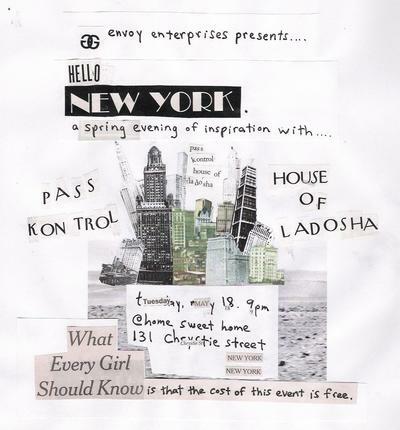 Pass Kontrol are the producers of “Welcome To Bushwick”, a free compilation album of bands and musicians living in their neighborhood. For two years, they have taken part in the Bushwick Arts Festival by hosting the open recording session, “Cut A Hit Record With Pass Kontrol”. The group has also made several short films including “The 21st Arrondissement Of Paris: Bushwick”, which can be found on their MySpace page as well as YouTube. And unsurprisingly, New Hope City isn’t Pass Kontrol’s first crack at the stage. The band has written, produced and starred in two plays prior to New Hope City. “Radiohour Mit Pass Kontrol” and “The Outskirts Show” prior to their most recent play ‘New Hope City’.